Most of us never think about the possibility of losing an adult tooth until it actually happens. But the truth is that almost all of us will lose at least one tooth by the time we reach the status of senior citizen. Missing teeth can not only be damaging to our self-esteem, but they can also cause other health issues. For example, did you know that those with missing teeth are at greater risk of gum disease, tooth decay and even for developing facial deformities? The best solution for a missing tooth is usually a dental implant. Not only do dental implants give you the ability to talk, chew and smile with more confidence but they also help protect you from many of the health problems commonly associated with missing teeth. 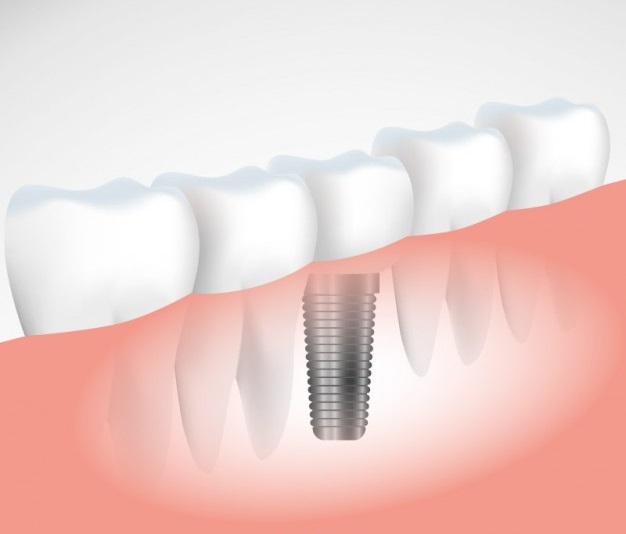 Dental implants are prosthetic teeth that are anchored into the jaw using a small titanium rod. On top of the rod is a dental crown that has been custom made to the shape and colour of a healthy, natural tooth. Unlike removable dentures, implants are permanent – and after a few days you will not even notice the difference between them and your real teeth! Once the implant is in place, simply care for it as you do your other natural teeth. The implant itself can last a lifetime if it is properly cared for while the crown on top of the implants can last 15 years or more. In most cases, dental implants will require at least two trips to the dentist. If no other procedures are being done in the same visit, you can expect the implant itself to take about an hour. Once your mouth has healed from the procedure, the crown can then be attached. While no one likes to think of themselves as getting older and requiring dental implants, the truth is that this is a fairly common, safe and effective procedure. With dental implants, you can regain your confidence, enjoy your favourite foods and help to keep your entire mouth healthy. If you have missing teeth or if you are scheduled to have a tooth removed, you should speak to your dentist about getting a dental implant. And if you are in search of a dentist in the Milton area, contact Sapphire Dental Centre today at 905-878-8760.